Vanilla flavored custard powder prepared with milk and sugar, as per pack instructions, to make wide variety of desserts. Product Contains Milk & products of these and Sulphite (=/> 10 mg/kg). 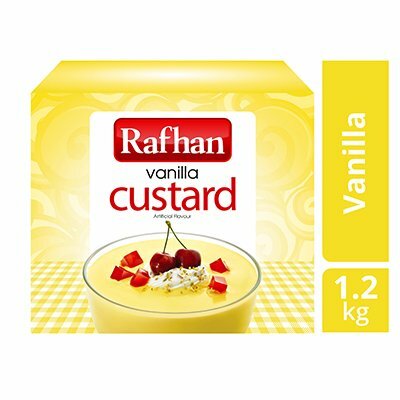 • Add 4 tablespoons (60gm) of Rafhan Custard powder in one cup milk (200ml) and make a paste. • Mix 8 tablespoons (120gm) of sugar in 4 cups of milk (800ml) and bring to boil. • Add custard paste to boiling milk and cook while stirring until texture is thick and smooth. Rafhan custard is ready now. Keep stirring the Custard after cooking until the custard cools to avoid top layer formation on the surface.